Update! 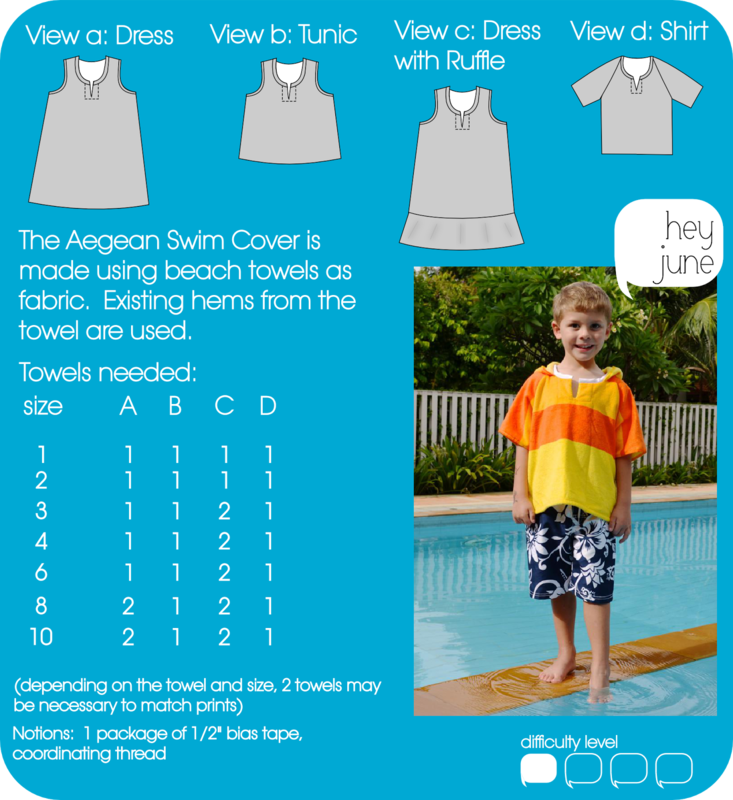 The Aegean Swim Cover is now available for purchase! 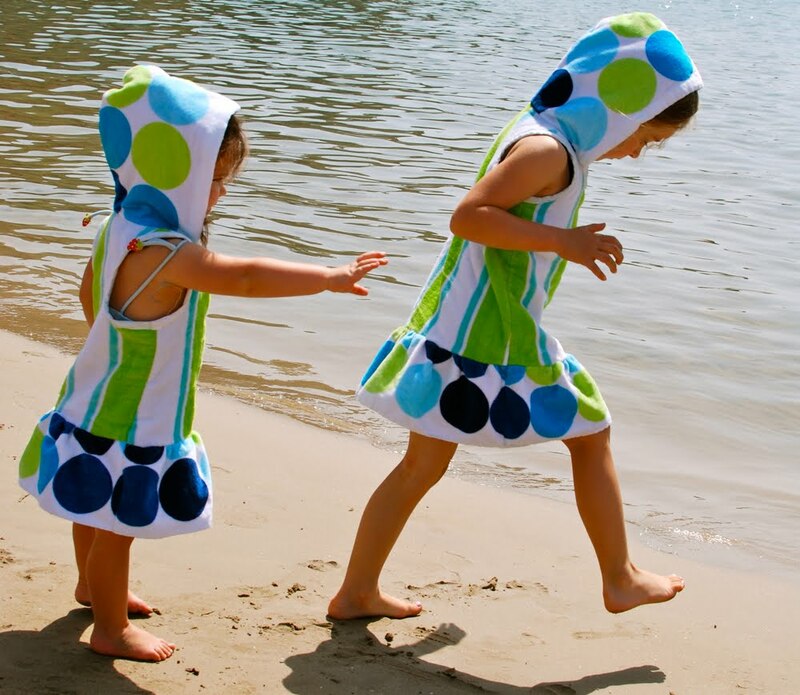 Buy the .pdf pattern and you’ll take all the guess work out of making beach towel dresses/cover-ups, and you’ll also get 4 different style options! There is still the original ruffle dress, but now you can also make a dress without a ruffle, a tunic, or a boy’s raglan sleeved hoodie! The pattern has also been updated to include a notched neckline for easier dressing. 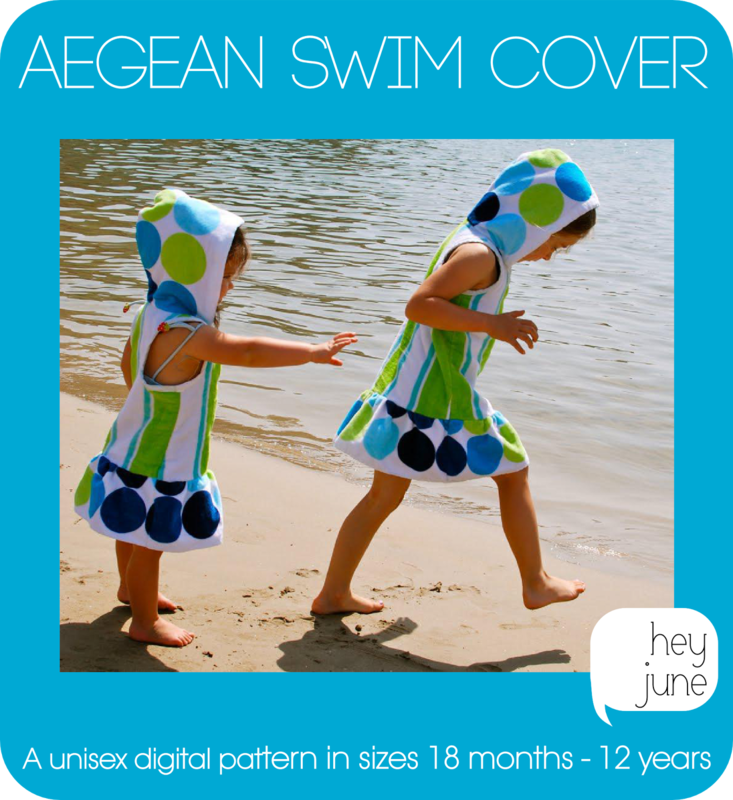 Head over to the shop to read more about the Aegean Swim Cover! Line up the red lines below with the hem of the towel to save yourself some hemming later. First, ruffle the trim and sew it to the bottom of the dress pieces. Sew the two hood pieces together. Then sew the dress together on the side seams and shoulder seams. Sew the hood to the neckline. Finish the arm holes and neckline with bias binding. When you sew the bias binding around the neck, make sure you catch the hood’s seam allowances also. My favorite part about these? No Dora in sight. What is up with swimsuit covers and licensed characters? Seriously! I must make one NOW! Thank you!!! so so so great! I’ve been wanting to get my girls some kind of towelish cover up and this is so cute! those are seriously too cute! These are SO cute! I know exactly what post of Dana’s you’re talking about because my first thought when this post popped up on my reader was that she had made these to go with hers! I’m so impressed! Ummm yeah this is freakin’ adorable!! I Love it! And can I live by you so I can hang at that beach too!!! oh Adrianna…they turned out great! I’m glad it worked out the way it did too so that your creative mind came up with this cool version instead! I never would have thought to do it that way. And it’s so cute to see the two girls together in their matching coverups. cute stuff! These are an absolutely perfect companion to Dana’s Mama version! OMG – how gorgeous are these coverups!! Thanks for this. I now need to go find some towels to convert – shame we don’t have Target in the UK. SO, SO CUTE!!! Thanks for the great ideas! LOVE these! So so cute. The towel prints are perfect for your design! 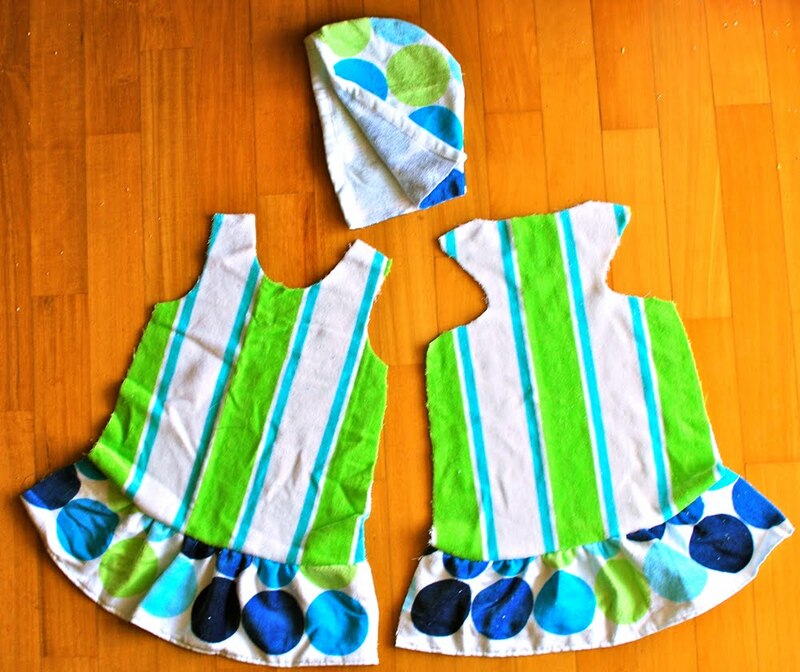 I have two little girls I need to make these for–totally adding this project to my list! Thanks! The hood is especially genius, because kids never think to dry their hair! I love it. K, I must feature this tonight!! Seriously ADORABLE!! ADORABLE! And I have those exact towels too! They will have new life soon. Thank you for the awesome idea. The hood is my favorite part! so cute! i made my girls bathrobes out of ikea towels, 20 dollars each, you can’t buy good quality and cute robes like for even tree times that amount (here in switzerland). i love how you bound the seam allowance of the hood. oh my goodness I can’t handle how cute these are – must make one RIGHT NOW! 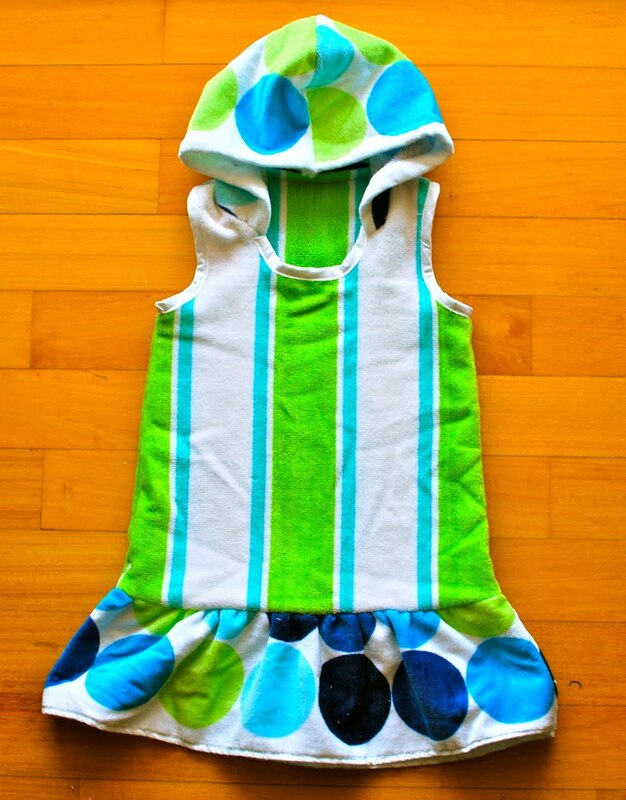 I JUST BOUGHT a towel to make a swimsuit cover for my little one – I can’t wait! FABULOUS WORK!!! I love how they have a hood, since long hair always keeps dripping. The skirt bottom is so cute. Great job! I love it! That is awesome! I must make one for my daughter! I love how easy it is! Thank you! I actually like this version even better! 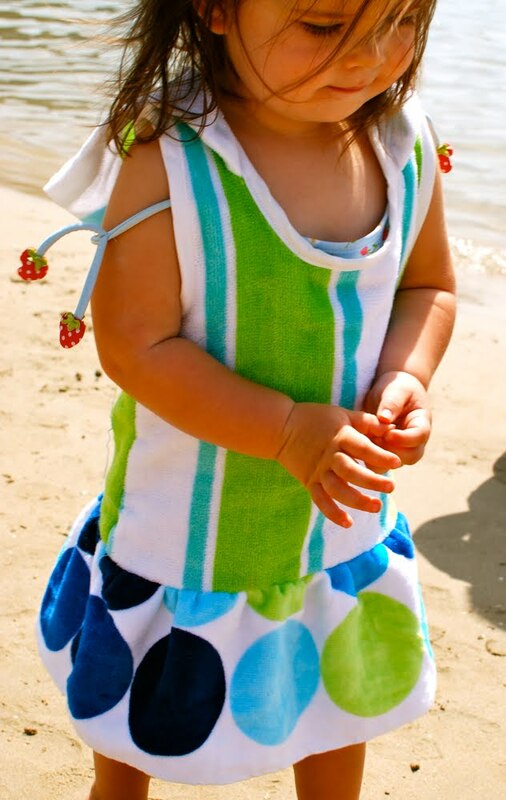 I was seriously having towel envy when I saw Dana’s coverup and they look uber-cute on your girls too! Now I just need to make a winter run-to-the-car-from swimming-lessons coverup and I’ll be set. Thanks for the inspiration and the tutorial-ish! I’m with you on the whole licensed character aversion. I like your cover up better than DANA’s ;) because my daughter won’t wear anything with elastic shirring. She says it’s too uncomfortable. She’s going to love this! These are the cutest little cover ups I have ever seen. Your models are even cuter. My girls are grown now, but I would have loved to make them each one- they would have loved wearing it. I’m the same with characters on clothes, etc. But I have a question…how do you know how big, what shape to cut the towel body pieces? Super cute! I came across Dana’s site last week and bought her pattern and WANT to make the dress… I NEED to make these too now. I’m determined to better my sewing skills over summer… they can only improve, since I don’t have much skill at all right now. These are wonderful! I think I have to make some for my girls – seriously cute! They are the cutest things ever! The towels you used are awesome. Your little girls make them look even better! HI I found your blog via Ponytails & Fishscales. I love this cover up!!! What a seriously great idea! You have some fantastic projects on your blog, I’m glad I found you!! I’m very much an amateur seamstress but I can’t wait to try these. This are some of the cutest things I’ve ever seen! Functional and adorable. Thanks for sharing. Much too cute for words! I am in swe! I will be featuring this at somedaycrafts.blogspot.com in a few days. Grab my “Featured” BUTTON. Saw your creation featured on U create and I think it is cute! :) Clever! great idea, thanks for sharing ! so nice! i posted a link to your tutorial at my blog. i also used a picture. hope you don’t mind, but if so: please let me know! These are so cute! I love the colors, and that they match! I’d love to have you share this at my For the Kids Friday Link Party! Stop on by and see what we’re up to! OMG – that first photo could seriously be of my two daughters!! Just showed it to my husband and he thought it was, so did the rest of the family. Very spooky! My little Mia looks exactly the same. Thanks for the great idea! I made one for my daughter over the weekend. I added your link to my own blog description. These are absolutely adorable! I am going to have to add them to my ever growing list of sewing inspiration and projects. Did you freehand the bodice/dress pieces? Great idea! I think I used the same polkadot towel for my beach robes. Found you on pinterest. Love! Hi my name is Julie, and I’m a newbie to sewing:) Love these, so adorable!! Wandered if you could give me measurements and to what age these were for? Maybe I can figure out the rest for different sizing for different ages lol..maybe:/ Thanks. Hi Julie! Sorry, I have no idea what measurements they were, but a great way to measure the width is to have your subject put their arms down against their sides, then measure the circumference around their belly, including the arms. This way you know it’ll slip on over their head without a closure. It’ll be baggy, but hey, it’s a swim cover :) The length is totally up to you, but I suggest ending the dress(including the ruffle) just below the knee. I think kid’s skirts & dresses that go any farther just look too big, but that’s just me. 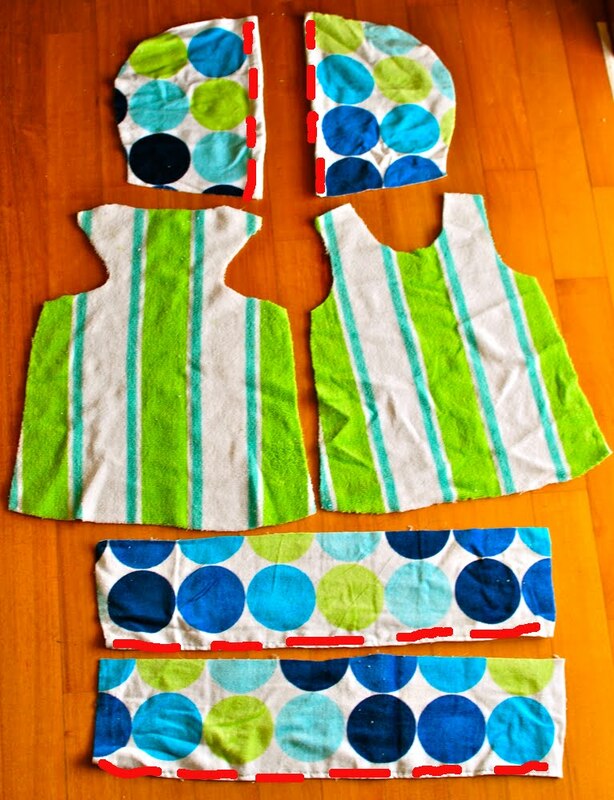 Do you have a template or layout sample to cut towels for these and did you use a towel for each one made? I left a request for a sample layout or template. My email is kellyra65@gmail.com. What a fantastic idea! So cute! Thank you for sharing! I am interested in buying the pattern and license, but on the pattern detail it does not show the hood. Is the hood included in the pattern itself?